The daughter of a successful lawyer, Linda Eastman received an arts education at the University of Arizona before beginning a career as a professional photographer in the early 1960s. Initially associated with the New York Town and Country magazine, she later moved on to work for Rolling Stone, photographing many of the leading music performers of the era. It was while on one of these assignments - a promotional photo shoot for the release of The Beatles' Sergeant Pepper's Lonely Hearts Club Band - that she met her future husband, Beatle Paul McCartney. Perhaps she was attracted to the funny little moustache he had at the time. Two years after their meeting, Linda brought the collective ill-will of thousands of rabid teenage girls upon herself by marrying Paul. Shortly afterwards she brought the ill-will of some Beatle fans upon herself when they sought to blame her (and fellow Beatle-wife Yoko Ono) for the break-up of the band. In a bid to maintain her position as Ms. Popular, she then brought the ill-will of music critics upon herself by becoming of one the core members of her husband's new band Wings despite lacking any developed musical ability at the time. She learned the hard way (on stage) and ignored the jeers, maintaining her musical partnership with Paul throughout the lifespan of Wings and into his subsequent solo work. 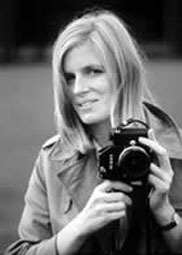 Throughout her married life Linda McCartney continued to pursue her photography, and she has been extensively represented in galleries around the world. She also became a vocal animal rights and environmental activist, working in association with organizations such as PETA, Lynx (an anti-fur lobby), and Friends of the Earth. In 1989 she published Linda McCartney’s Home Cooking, a guide to vegetarian cooking, which became a best-seller in both the U.K. and the States. She then followed up with her own line of pre-prepared vegetarian meals - a venture so popular that it brought her millionaire status alongside her husband (come on - how much money does one couple need?). The McCartneys had three children together: Stella (now a prominent fashion designer), Mary and James; Paul also adopted Linda's first child Heather from a previous marriage. The couple maintained that in their 29 years of marriage, they never spent a day without each other, with the exception of the 10 days Paul was forced to spend in jail after a pot bust. Their unwillingness to be separated was in large part the motivation behind Linda being drafted into her husband's musical projects. In 1997 Linda gained the official title of 'lady' when her husband became another in the long line of pop stars given knighthoods by the queen of England. She died the following year when the breast cancer she had been fighting since 1995 spread to her liver. The only solo collection of her music, Wide Prairie, was posthumously released in 1998.